So first off, I have a quick story for you. There are supposed to be four bottles pictured above, but silly me gave away one of them before I got around to taking these pictures! (The swatches were already done.) A friend's son is in love with nail polish right now and was sad because all of their polishes chipped quickly. So I gave them a bunch of mine from better brands (including the CND Vinylux shade that is missing here) to see if they worked better for him. So imagine there is a fourth bottle in this picture! First up is CND Vinylux Date Night from the 2016 Flirtation Collection. 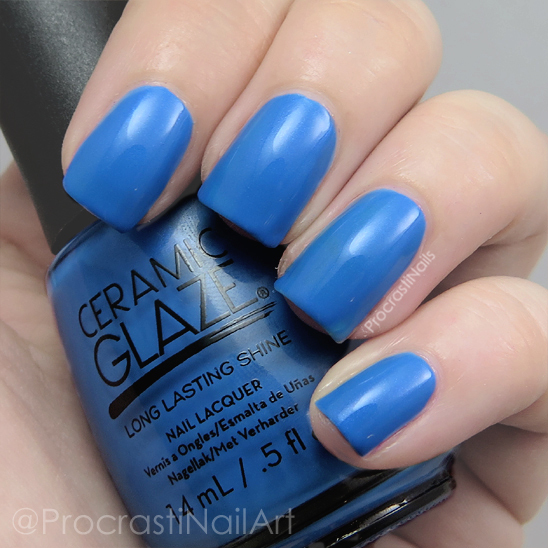 This is a pretty and warmer-leaning blue creme polish that applies opaque with only one coat. The next shade is also by CND Vinylux and it's called Reflecting Pool. 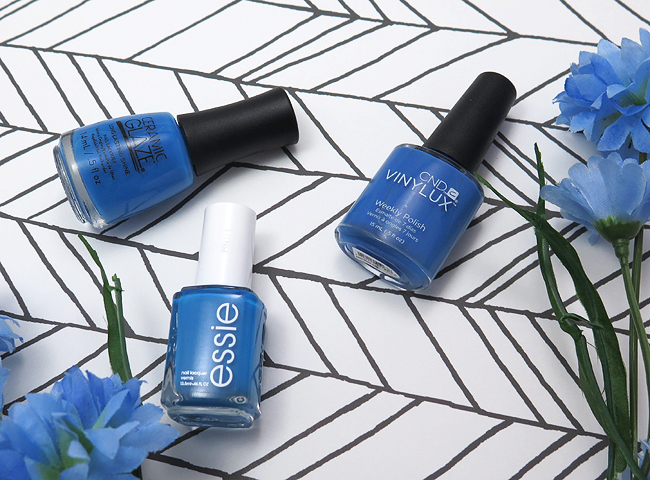 This cool blue is from the Summer 2015 Garden Muse Collection and applied smoothly with two coats. Ceramic Glaze French Riviera is from the 2016 Botanical Oasis Collection. This is an ocean blue creme and it took two coats to build up to full opacity. And last but not least we have Essie Nama-Stay-the-Night from the 2016 Resort Collection. This is a beachy blue creme and it took three coats to build up, which is the most of all four shades. This one has the most obvious difference in shade compared to the others, and to be honest I included it mainly so I would have a different shade for each of four fingers to show... Haha. Yesss, the best part. Okay, so to start with as far as I am concerned (though a non-polish lover might drop their jaw at me for saying this) these are all completely different shades of blue. You with me? Let's brake it down. 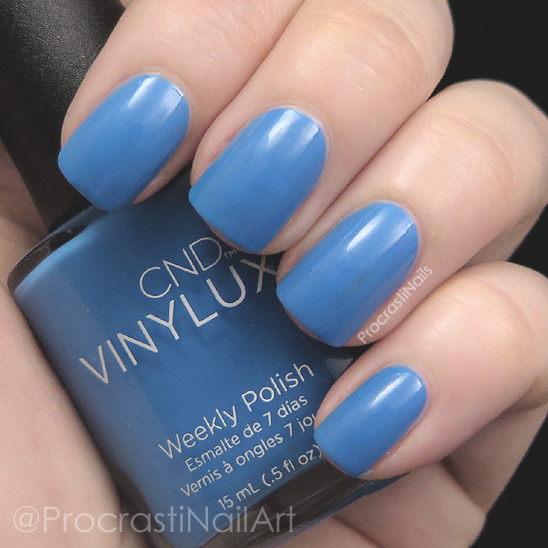 CND Vinylux Date Night: This is more of a deep, slightly dull (in a good way!) cornflower blue. 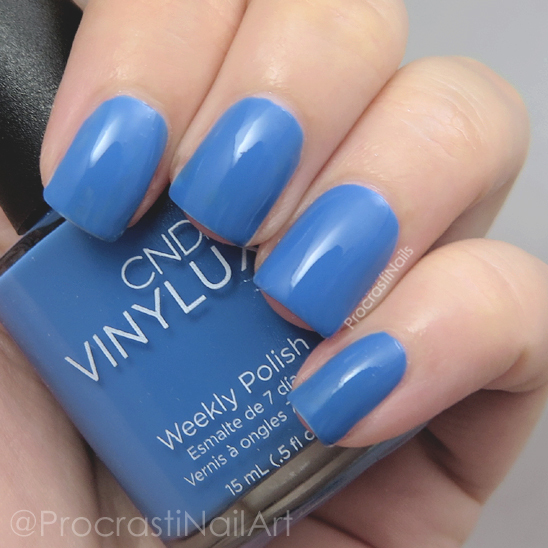 CND Vinylux Reflecting Pool: Slightly lighter shade than it's CND sister, and also a slightly cooler tone. Ceramic Glaze French Riviera: Arguably the brightest blue of the bunch, the colour is just that much deeper than the first two. 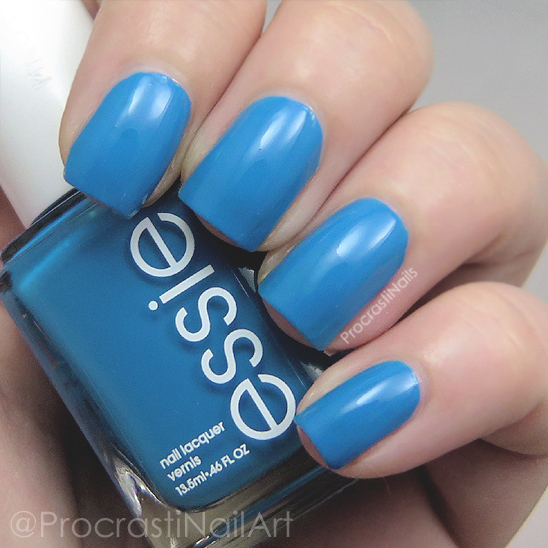 Essie Nama-Stay-the-Night: As predicted this is the most obviously different of the four... It's got a hint of aqua in it that really pulls it away from the others. I am perfectly content ruling these all to be different shades, though to be honest you definitely don't need all of them. If you were to pick up two I would say go with Essie Nama-Stay-the-Night (because I love that slight aqua tint) and CND Vinylux Date Night (because it's a magical one-coat polish so it's multipurpose -- yay stamping!). Are there other blues you think I should compare to these? Have other ideas for comparison posts? I love doing them so let me know! So helpful to see these three blues swatched and compared to each other. That is very helpful! I really want Date Night now, for stamping!!! Easily different shades! Great post! I really need to look into trying CND. I love comparisons post! 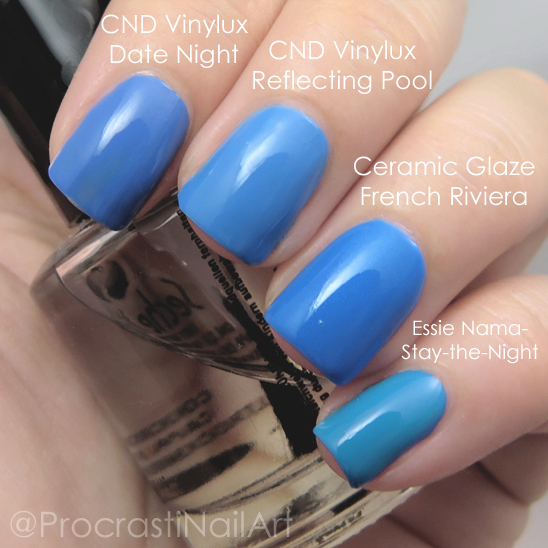 My favourite of the bunch is French Riviera but I think Date Night is the one looking better on you. Is it the one you gave away? Haha. I love comparison posts! I think I have the Essie somewhere in my stash, but don't wear it too often. Really fantastic comparison post! I think my favorite shade is from Ceramic Glaze.